Check out Tobi's Chill With Me Boyfriend Blazer Borrowed from the boys: the Camel Chill With Me Boyfriend Blazer is a single button jacket with a relaxed boyfriend fit, a notch lapel and flap pockets. Sure, you can wear it for work for effortless elegance; we also like this trendy blazer worn off duty with a band tee and denim. Borrowed from the boys: the Black Chill With Me Boyfriend Blazer is a single button jacket with a relaxed boyfriend fit, a notch lapel and flap pockets. 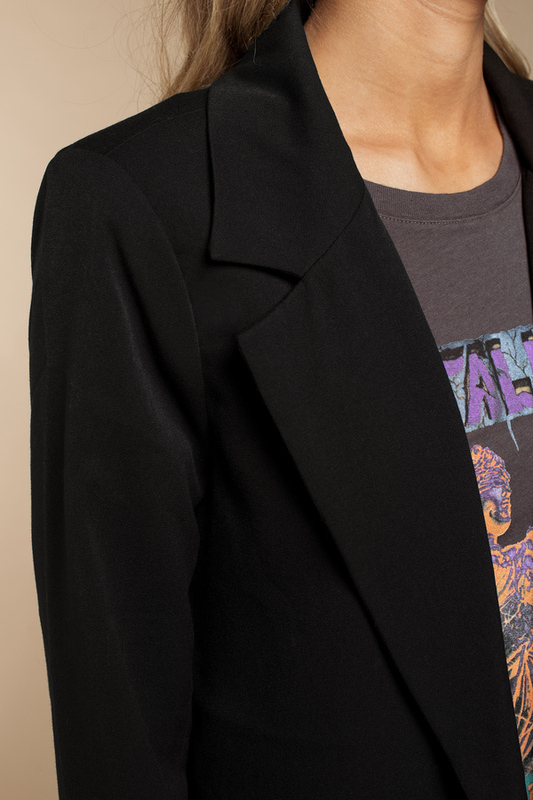 Sure, you can wear it for work for effortless elegance; we also like this trendy blazer worn off duty with a band tee and denim. Borrowed from the boys: the Camel Chill With Me Boyfriend Blazer is a single button jacket with a relaxed boyfriend fit, a notch lapel and flap pockets. Sure, you can wear it for work for effortless elegance; we also like this trendy blazer worn off duty with a band tee and denim. Black, Camel modeled on a size Small.